Kessler & Associates, P.C. | Is Time On Your Side? Medicaid And The Death Of A Good Estate Plan. You are here: Kessler & Associates, P.C. » Tax Tips » Is Time On Your Side? How long do you have to keep your tax records? Like many issues of law, it depends. Practically speaking, the statute of limitations on additional tax assessments runs for three years from the time you have filed your tax return or the due date, whichever comes later. However, the IRS has the ability to go beyond three years – up to a period of six years – to audit a tax return if it suspects that income has been substantially underreported. In this case, “substantially” means an understatement of 25 percent or more of the gross income reported on the return. And there are no time restrictions if a false or fraudulent return is filed. 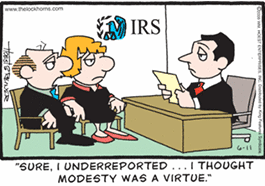 In those cases, the IRS can go back as long as it wants to assess taxes, plus penalties and interest. To play it safe, we recommend keeping records for as long as ten years. Conversely, if you are trying to remove clutter from your files, three years is the base minimum. Copyright 2019 Kessler & Associates P.C.